In Talavada village in Beed district of Maharashtra, farmer Sahibrao Athole made one last attempt to call for help. Lying alone in his field on the night of June 12, 2014, Athole was gasping for breath. He had consumed a litre of pesticide. Athole used his mobile phone to call a friend and left a message for his family. He told him he had gulped down a bottle of pesticide and that he was dying. At first, Athole’s brother, Rahul, did not believe the message. But he soon realised that it was too late in the night for his brother to play a prank. He rushed to the field, about four kilometres from their house, and found Athole lying unconscious. He was frothing at his mouth. Rahul picked him up and ran a kilometre to reach the road. From there, he was taken to a private hospital. Athole showed some signs of recovery initially, but lost consciousness again after two days. On the ninth day, doctors declared him dead. At 33, Athole was the only breadwinner of his family which included his wife and three children as well as Rahul, his wife and child. “He was extremely hard-working. He would work in the fields early mornings and late evenings and earn daily wages as a labourer during the day. He wanted to give a good future to the family,” says Manisha, Athole’s wife, her voice breaking through her tears. Two years after his father died, Athole managed to convert his mud house into a brick-and-plaster structure with separate sections for the two brothers and their families. He paid back a loan of Rs 1.5 lakh taken for the construction of the house. But there was another set of pending loans. In 2011, he had borrowed Rs 60,000 from a government-owned bank and Rs 150,000 from a private moneylender. In 2012, he planted sweet lime and watermelon on a small patch of land and cotton on the rest of the one hectare with the loan money. 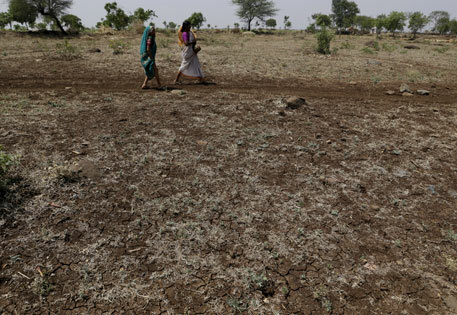 The same year, however, all eight districts of Marathwada—Aurangabad, Jalna, Beed, Osmanabad, Nanded, Latur, Parbhani and Hingoli—faced one of the worst droughts in recent history. 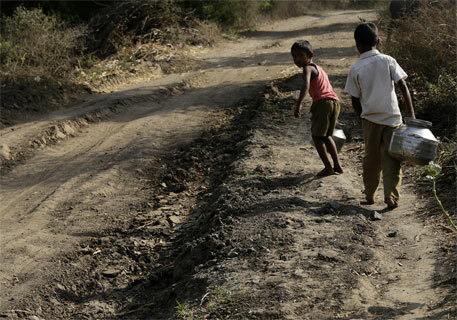 In all, more than 11,000 villages in Maharashtra and 6,500 villages in Marathwada faced severe water crisis. Around 3,900 villages suffered more than 50 per cent crop loss. Athole’s crops failed during the drought of 2012. He tried to recover from the heavy loss in 2013, but it didn’t prove to be a good year. The unseasonal rains and hailstorms of March 2014 were the final straw. Athole’s rabi (winter) crop was damaged by the rains. He committed suicide three months later. That year, crops worth Rs 20,000 crore on 400,000 hectares of land in Marathwada were destroyed in the first fortnight of March. 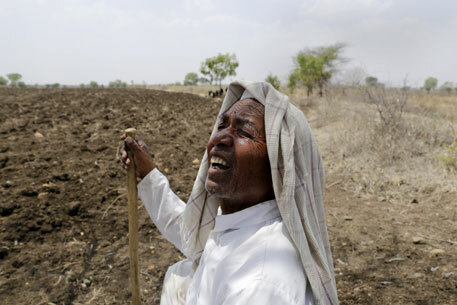 Since 2002, Marathwada has seen between 200 and 250 farmer suicides every year. But since the drought of 2012, this number has reached an all-time high. Since January 2014, around 900 farmers ended their lives due to crop failures, according to government data. At least two farmers committed suicide every day in the first four months of 2015. Unofficial numbers could be much higher. Numbers in Marathwada have, thus, surpassed those of Vidarbha which was notorious for being the farmer suicide capital of Maharashtra. Eighty-seven per cent of Marathwada depends on rains for agriculture. The average annual rainfall of the region is as low as 779 mm. Rainfall in 2014 was just over half of this amount. “Many farmers could not survive crop loss due to failure of the monsoon. Those who could, invested in the rabi crop in winter, hoping that better efforts would fetch them better yield and this would help them recover the loss of the previous crop,” says Sanjeev Unhale of Aurangabad-based non-profit Dilasa Janvikas Prathishthan which works with farmers in the region. Rabi crops need two to three good showers between October and January, especially in rain-fed regions like Marathwada. But with the deficient monsoon, those showers barely arrived. And like in 2014, unseasonal rains returned in March again this year, damaging whatever little had managed to grow. “This hit the last nail in the coffin. With the loss of all their investment, no saving in hand to feed their families and no hopes of getting further loans or ever being able to pay back the debt, many farmers ended their lives,” adds Unhale. A yet-to-be-published study by Unhale’s organisation on the current pattern of farmer suicides reveals that in most cases, the trigger is the farmers’ inability to meet obligations like the expenses of a daughter’s wedding, children’s education or health emergencies. Besides, unlike in Vidarbha where most farmers who committed suicide were over 40 years of age, farmers as young as 23 are killing themselves in Marathwada. “Farmers here have a very high sense of esteem. They cannot take the humiliation of not being able to pay the debt or meet social obligations. Also, landholdings here are smaller than that in Vidarbha and farming families are becoming nuclear. Young farmers who have recently taken up the responsibilities of their fields are more vulnerable to psychological pressures,” explains Unhale. Marathwada has been traditionally prone to droughts. Almost every twenty years, a big drought has hit the region, while smaller droughts keep occurring in the interim. However, since the El Niño led to a deficient monsoon in 2009, extreme weather events have become more frequent. There were little rains in 2010, 2011 and 2013 and severe droughts in 2012 and 2014. 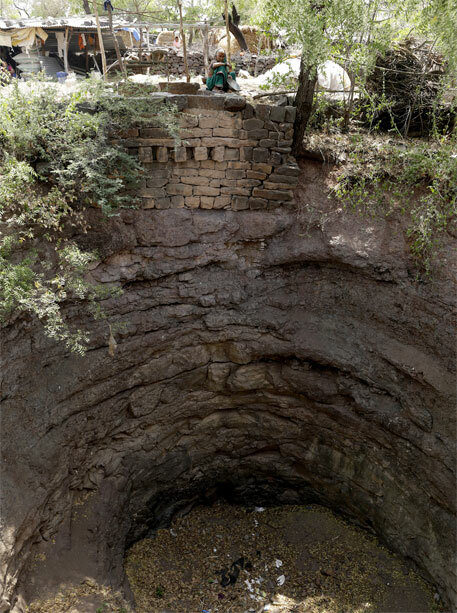 Cracked soil, parched wells, dry hand pumps, malnourished livestock and locked houses—this is the state of Gitewadi, another village in Beed district. 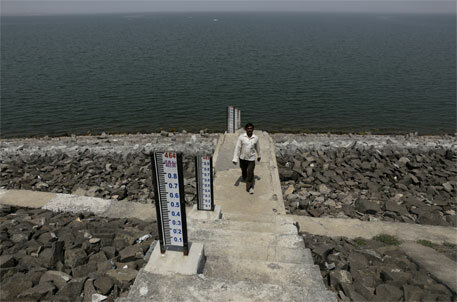 On the edge of the village lies Dadegaon dam, constructed on Kadi river five years ago. Today, there is no river and no reservoir. The huge concrete structure has been empty for the last three years. Of the 120 families in the village, around hundred couples have migrated to western Maharashtra to work as sugarcane cutters. There are almost no adult men and women left. One sees only old women and school children. “Every year, people migrate in couples in October-November after sowing their fields. If there is any rain, they come back to harvest the fields. Otherwise, they just leave it. They then come back in May-June hoping for monsoon rains,” says Sopan Garaji, a journalist-turned-activist in Beed. Beed is considered “the factory” of sugarcane cutters. Every year, around 800,000 people migrate to western Maharashtra to work in the sugarcane fields. A couple earns around Rs 40,000 for the whole season. Vijay Diwan, president of Nisarga Mitra Mandal, an Aurangabad-based non-profit working for water rights, attributes the prolonged drought to climate change. “Till five years ago, we thought climate change was a phenomenon happening somewhere in the world. But, before we could realise what was happening, it was right here at our doorstep,” he says. The continuous droughts have affected the productivity of the soil. “Salt accumulation is increasing and soil reclamation is not taking place. Thus, the average rainfall of 500 to 800 mm does not sustain a healthy crop anymore,” says S B Warade, a soil scientist formerly associated with the Marathwada Agricultural University, Parbhani. According to the study by Dilasa Janvikas Prathishthan, almost 95 per cent of the farmers who committed suicide in the past year were cotton cultivators. Cotton is the traditional crop of Marathwada. It requires less water than cash crops. The promotion of Bt cotton since 2006 has, however, increased the capital cost incurred on cotton production exponentially. Though the yield from planting Bt cotton was high initially, it has been declining continuously for the last four to five years. Farmers from Hiranpuri village in Aurangabad told this correspondent that till three years ago, they would get up to 300 kg of cotton from less than half a hectare of land. Last year, the yield decreased to 200 kg and, this year, it was less than 100 kg. “The constant drought combined with the excessive use of chemical fertilisers have brought down the carbon content of the soil from 1 per cent to 0.3 per cent,” says Warade. To make matters worse, the price of cotton, which is entirely dependent upon international markets, has been constantly falling. “In 2010, cotton would fetch Rs 7,000 per 100 kg. Now, it is sold for hardly Rs 3,000. Thus, the per unit production cost of cotton is often more than or equal to the price of the crop that farmers get from each unit of land,” says Shashi Kevadkar, a Beed-based journalist. With failing returns from cotton, distressed farmers are turning to the more lucrative but water-intensive sugarcane. Athole’s brother, Rahul, who now faces a debt of Rs 3.5 lakh, has replaced his entire cotton crop with sugarcane this year. “I did not have an option. Sugarcane is the last bet I could take to pay off the debt. It requires only one time-investment, but can give up to three crops. Since there are so many sugarcane factories in the region, I hope to get a good price for the crop,” he says. “This is the general trend in Marathwada. But the problem is sugarcane needs more than 2,000 mm of rainfall. Since there is no rainfall, whatever little surface and groundwater is available in the region is guzzled by sugarcane-growing farmers at the cost of those who grow traditional staple crops,” says Diwan of Nisarga Mitra Mandal. The sugar factories set up by politicians in the region are also big water-guzzlers. A study by South Asia Network on Dams, Rivers and People last year said the water used by factories could irrigate nearly 3,240 hectares of high-yielding groundnut or take care of the drinking needs of “nearly 1,585,000 people till the onset of 2015 monsoon”. “In the last decade, traditional crops of the region like groundnut, jowar and soya bean that gave sustainable food and income to the farmers with less water have totally been replaced by cash crops. This has made them vulnerable to greater losses,” says Joy Daniel of Institute for Integrated Rural Development (IIRD), an Aurangabad-based non-profit which promotes organic farming in the region. Rahul Athole has invested Rs 70,000 in a drip irrigation system for his sugarcane crop. But it will work only if the well in the corner of his field has enough water throughout the irrigation cycle. Sugarcane requires irrigation for up to a year and a half. The left bank canal of the Jayakwadi dam in Aurangabad, one of the largest dams in Maharashtra, passes right behind Rahul’s fields. But it has hardly any water. “The water is released once or twice in the season. That gives us water for only 15 days,” says Rahul. The shortage of canal water since the 2012 drought was one of the major reasons why his brother suffered crop losses. Jayakwadi was constructed on Godavari river in 1974 with the ambition to irrigate 0.18 million hectares of land in Aurangabad, Jalna, Parbhani, Beed and Ahmednagar districts. Initially, around 70 per cent of the total 2,909 Mcum (million cubic metres) storage capacity was allocated for irrigation. The right and left bank canals (89 km and 208 km respectively) were built for the sole purpose of irrigation. By 2012, however, 21 per cent of planned irrigation water was diverted for non-irrigation use, including domestic water supply to four cities, the 1,130-megawatt Parli power plant in Beed, and the Maharashtra Industrial Development Corporation (MIDC) units in five districts. This has resulted in the reduction of 36,500 ha of irrigation potential of the dam, points out a report by Pune-based non-profit Prayas. While these figures represent plan allocation, the actual allocation in a season of scarcity is much more skewed, says Pradeep Purandare, expert member of the Marathwada Development Board. “Whenever there is scarcity, the water allocation for domestic or industrial use is not compromised. The burden of losses is almost entirely borne by farmers. At times, farmers would not get even a single rotation of water in a season due to scarcity,” he adds. During water crisis, the upstream dams on the Godavari, which cater to northern and western Maharashtra, do not release water to Jayakwadi. This despite the fact that Maharashtra Water Resources Regulatory Authority (MWRRA) Act, 2005, mandates equal distribution of water to all projects in a river basin during water crisis. During the 2012 drought, water in Jayakwadi dam dropped to two per cent of its storage capacity of 107 thousand million cubic feet (tmc). But upstream dams in Pune and Nashik regions, which were 81 to 92 per cent full, did not release water. “Strong political considerations dictate water distribution in the state. The region which has political clout takes away the lion’s share,” says Diwan. According to the report of a high level committee (HLC) constituted by the Maharashtra government to suggest measures for “balanced regional development” in 2013, Marathwada constitutes 31 per cent crop area of the state but it uses only 14 per cent of the state’s surface water. Western Maharashtra, on the other hand, has 36 per cent crop area of the state, but uses 47 per cent of the water. And Vidarbha, with 30 per cent crop area, uses 28 per cent water. Due to skewed policies of the state, Marathwada has the lowest ratio of actual irrigated land vis-à-vis the irrigation potential created. Of the potential land that can be irrigated by dams created in the region, only 38 per cent is actually irrigated. For Vidarbha, this ratio is 47 per cent while for the rest of Maharashtra, it is 76 per cent, pointed out the HLC headed by the former finance secretary of India, Vijay Kelkar. This imbalance in water distribution is part of the policy neglect the region has been facing from the ruling political classes. Till 1961, Marathwada was part of the state of Nizam of Hyderabad. The region was always backward in terms of availability of natural resources and access to capital investment. It was included in the state of Maharashtra with the promise of development at par with other regions in the state. Several committees and boards were constituted to recommend measures to bring Marathwada and Vidarbha at par with prosperous western Maharashtra (the hub of agricultural productivity and industrial development). But many of these measures were never implemented. 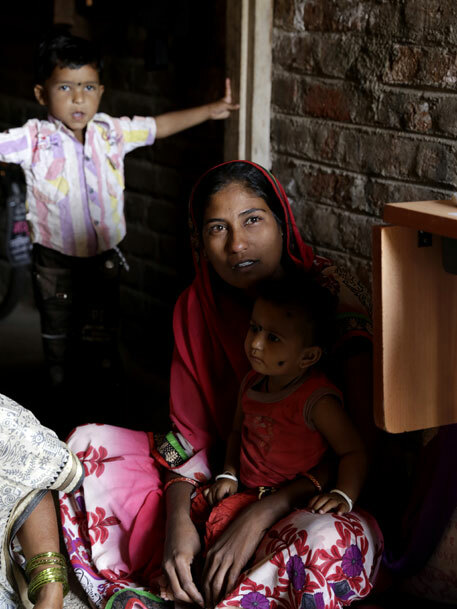 The per capita income in Marathwada is 40 per cent lower than the rest of Maharashtra. Vidarbha’s per capita income, on the other hand, is 27 per cent below the rest of Maharashtra, according to the HLC. It has been 18 months since the committee submitted its report to the state government, recommending increasing the share of Marathwada and Vidarbha in Plan funds as well as water distribution. The state Assembly has not accepted the report yet. “Chief Minister Devendra Fadnavis and Union rural development minister Nitin Gadkari hail from Vidarbha. Former Union agriculture minister Sharad Pawar hails from western Maharashtra while the current agriculture minister of the state is from northern Maharashtra. This powerful clout of leaders is busy diverting development funds to their own region. While the leadership of Marathwada was always meek, the region has suffered huge setbacks with the deaths of Pramod Mahajan, Vilasrao Deshmukh and Gopinath Munde,” says a senior Marathi journalist from Aurangabad, who does not wish to be named. In the first week of April this year, Jayakwadi dam had 251 Mcum of water which is only 12 per cent of its live storage capacity. This would just about fulfill the water requirements of main cities and industrial areas in the region. The upstream dams, on the other hand, were filled with over 50 per cent of their capacity. India Meteorological Department, in its southwest monsoon forecast for 2015, said there was an almost equal chance of rains being either “below normal” or “deficient”. If the monsoon plays truant yet again this year or water is not released by upstream dams to Jayakwadi, Marathwada farmers have little hope of salvaging their livelihood.